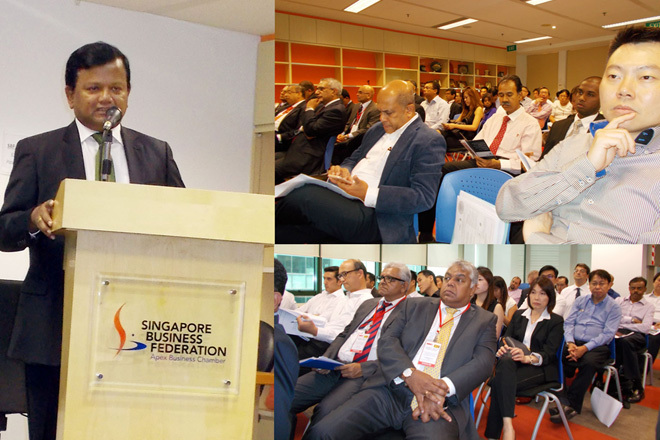 (BOI Media Release) – The Board of Investment of Sri Lanka in collaboration with Ceylon Chamber of Commerce participated at the Forum titled “Doing Business in Sri Lanka – Development Potential and Opportunities” held at the office of the Singapore Business Federation. At this Forum Mr. Upul Jayasuriya, Chairman of Board of Investment of Sri Lanka briefed over 100 participants drawn from the Singapore business community on the many attractive advantages that Sri Lanka can offer to investors in Singapore. In his address, the BOI chairman highlighted the business friendly policy of the current administration in Sri Lanka which had the pioneered the country’s liberalized economy in the late 1970s. Sri Lanka had been inspired by the founder leader of Singapore, the late Prime Minister Lee Kuan Yew. Mr. Jayasuriya also stated that the Government of Sri Lanka at the time, which is the same one which is currently in power, had opened the country’s first Export Processing Zone at Katunayake. A second Zone at Biyagama had been opened by Hon. Ranil Wickremesinghe, who is the current Prime Minister of Sri Lanka. The BOI Chairman added that Sri Lanka was the first South Asian country to liberalize its economy, well ahead of any other of her neighbours. Sri Lanka’s land prices are also some of the lowest in Asia, well below other South Asian neighbours. Another strength of the country was a strong democratic tradition that goes back 68 years and a political culture where Government changes have taken place through the ballot and not the bullet. He also stated that a key factor to invest in Sri Lanka was good governance adding that many Singaporean investors such as Prima had been longstanding investors in the Country. Another Singaporean success story is the World Trade Centre, currently the tallest building in the country and landmark of Colombo. Mr. Jayasuriya also added that the time was right for investors from Singapore to take the lead by starting investment projects in Sri Lanka. The current trend was very positive there had been a number of major projects signed this year. An agreement will be signed very soon with Volkswagen to assemble vehicles in the country. Sri Lanka was keen to attract international brand names and welcomed other leading automobile manufacturers to follow suit. Sri Lanka would make an effort to assist in any way investors from highly reputed companies by meeting their requirements. The chairman concluded by stating that the Singapore Federation of Business was formally invited to visit Sri Lanka to look at the possibility of investing in the country. Mr. Dilip S Samarasinghe, Director (Media & Publicity) of BOI made a presentation on the advantages of investing in Sri Lanka and the current status of Singaporean investments in the country. The presentation also covered the areas that Sri Lanka was keen on promoting in Singapore. Accompanying the BOI Chairman were Mr. Dilip S Samarasinghe, Director (Media & Publicity), Mr. Keizo Tsuchiya JICA Advisor to the BOI and Mr. Dhammika Basnayake, Assistant Director (Promotion). The other speakers included Mr. Alan Tan Director, ASEAN & South Asia of the Singapore Business Federation who covered business relations between Sri Lanka and Singapore. He stated that there were over 100 Singaporean companies based in Sri Lanka involved in a wide range of activities including construction, education and food processing. Mr. Tan added that Singapore businessmen have continued to operate in Sri Lanka in spite the global economic downturn. Mr. Tan said that Sri Lanka was an attractive destination because of its very liberal and business friendly economic environment. Singapore’s strength was in its ability to attract many enterprises and currently 7,000 multinational companies were established in the country. Mr. Tan added that the Singapore Business Federation has entered into a Memorandum of understanding with the Ceylon Chamber of Commerce and this was an opportunity for a dialogue between the private sectors of both countries. Another speaker was Mr. Arthur Teh of IE Singapore whose presentation on Sri Lanka showed improvements in the ease of doing business potential, on the potential for manufacturing as well as close political and economic ties Sri Lanka enjoys with both India and China. IE Singapore (An International Enterprise Singapore) was formerly known as the Singapore Trade Development Board. The main interest of Singaporean companies was in the areas of urban infrastructure, construction of Export Processing Zones, projects in city of Colombo or the neighbour areas and also manufacturing. He added that one area of interest by Singapore was processing of seafood from Sri Lanka for export to Singapore. Sri Lanka is already well known for her Crabs. The Ceylon Chamber of Commerce delegation headed by Mr. Shamil Mendis also covered the business climate of Sri Lanka and introduced the Sri Lankan business delegation to their Singapore Counterparts. The meeting concluded with one to one meetings between Sri Lanka and Singaporean enterprises with the purpose of trade and entering into joint ventures.